Welcome back to another flower tutorial! 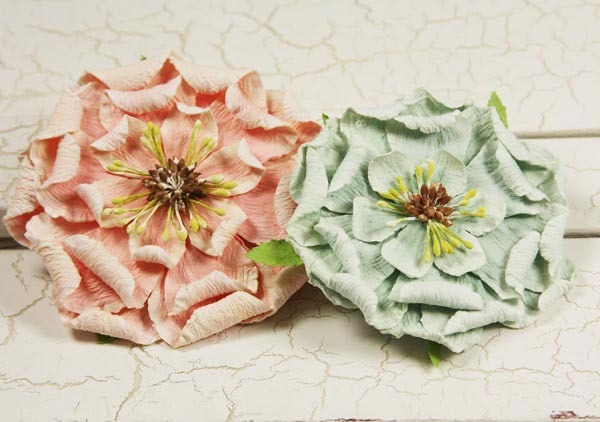 I was browsing through Prima flowers and I came across these beautiful blooms They inspired me to create my own similar flower. I'm sure a similar flower has been created before, but below is a tutorial of my version of the flower. I also tweaked the center of the flower a bit. The best paper to use for these is cardstock because both sides of the paper will show. If you are like me and love patterned paper, you can ink the white side of the paper with a coordinating color. STEP 1: Take Layer 1 and with the printed side of the paper facing you, curl back each petal with a wooden skewer or similar item. Flip your flower layer over and this is what it should look like. STEP 2: Loosen the curls using your fingers. STEP 3: Repeat Steps 1-2 on Layers 2 & 3. Notice that Layer 2 is slightly tighter than Layer 1, and Layer 3 is slightly tighter than Layer 2. This will help fit the layers into each other to create the flower. STEP 4: Take Layer 1 and add a dab of glue in the center. Fit Layer 2 inside Layer 1, remembering to off-set the petals. STEP 5: Add another dab of glue in the center of your flower and fit Layer 3 inside Layer 2. STEP 6: Loosen and adjust the curled petals with your fingers. STEP 7: Take your medium-sized cutout (Layer 4). If there are no spaces between each petals, cut a little slit between each petal. If you already have gaps between each petal, skip this step. STEP 8: Curl back each petal of Layer 4 and place the layer in the palm of your hand. Using an embossing stylus or similar item, press down into the center of the cutout, forming a cup-like shape. STEP 9: Adhere Layer 4 to the center of your flower. STEP 11: Adhere Layer 5 to the center of your flower. Use your skewer to flatten the center of your flower. STEP 12: Curl back the petals of your last layer. Only this time, adhere the layer upside down. The petals should curl inward. STEP 13: Add a bead, microbeads, glitter or whatever you desire to the center of your flower. Hope you enjoy making this flower. Thanks for stopping by! Until next time! 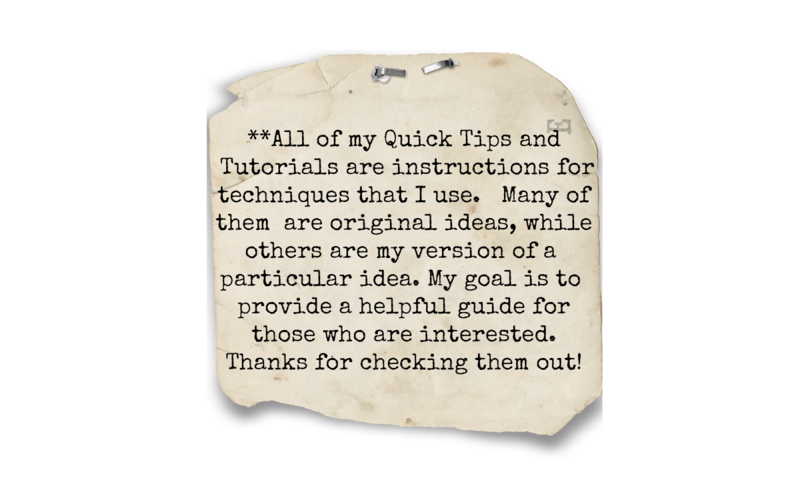 To see other tutorials, click on an icon below the 'Categories' heading located to the right of my blog. 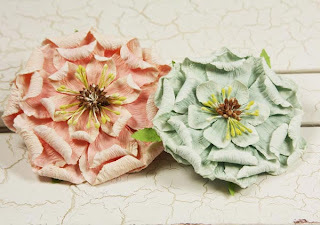 To see the entire layout where I used these flowers, click on the link below. Great tutorial!!! Please visit my blog for a Blog Award! Hugs!!! Great flower...there are some tutorials similar, but not just like this, and I really loved how you did the 3 smaller flowers better than the other tutorials! Thanks so much for sharing! WOW! Another amazing tutorial, like it so much more than the Prima! I also wanted to let you know how much I appreciate your blog postings, tips and tutorials. 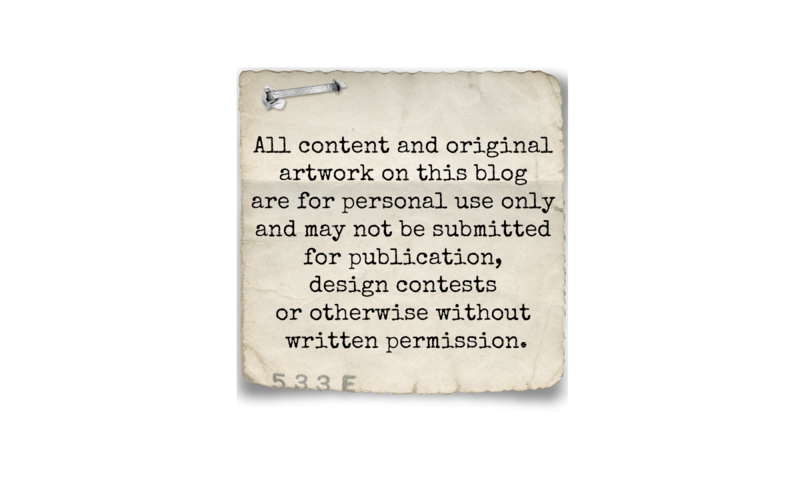 You're an amazing artist and just posted a blog award for you on my blog! Natasha...this layout is just beautiful! Love all the details...the ribbon..butterflies...and flowers...Just Gorgeous! Your flowers are beautiful. I did a tutorial a while back of the same flowers, and added my own twist as well!!! Go check them out!! Prima flowers always inspire me!! Amazing that we all come up with different versions of the same flower!! I love yours!! Your flowers are really awesome! May I know which dies did you use for these vintage blossoms? Many thanks!